“Yes, I truly believe what it says.” “Come closer to me,” the Zen master instructed the novice monk. When the novice monk drew near, the Zen master immediately used his thumb and index finger to pinch and twist the novice’s nose. neither caught in being nor in non-being. The nose of the novice monk is still sore, even today. Do you understand? The problem begins with the line: ‘Listen Shariputra, because in emptiness, there is no form, feelings, perceptions, mental formations, and consciousness’ (in Sanskrit: TasmācŚāriputraśūnyatayāmnarūpamnavedanānasamjñānasamskārānavijñānam). How funny! It was previously stated that emptiness is form, and form is emptiness, but now you say the opposite: there is only emptiness, there is no body. This line of the sutra can lead to many damaging misunderstandings. It removes all phenomena from the category ‘being’ and places them into the category of ‘non-being’ (no form, feelings, perceptions, mental formations or consciousness…). Yet the true nature of all phenomena is the nature of no being nor non-being, no birth and no death. The view of ‘being’ is one extreme view and the view of ‘non-being’ is another extreme view. It is because of this unskillfulness that the novice monk’s nose is still sore. The insight of prajñāpāramitā is the most liberating insight that helps us overcome all pairs of opposites such as birth and death, being and non-being, defilement and immaculacy, increasing and decreasing, subject and object, and so on, and helps us to get in touch with the true nature of no birth/no death, no being/no non-being etc… which is the true nature of all phenomena. This is a state of coolness, peace, and non-fear that can be experienced in this very life, in your own body and in your own five skandhas. It is nirvana. Just as the birds enjoy the sky, and the deer enjoy the meadow, so do the wise enjoy dwelling in nirvana. This is a very beautiful sentence in the Nirvana Chapter of the Chinese Dharmapada. The insight of prajñāpāramitā is the ultimate truth, transcending of all conventional truths. It is the highest vision of the Buddha. Whatever paragraph in the Tripitaka, even in the most impressive of the Prajñāpāramitā collections, if it so contradicts this, it is still caught in conventional truth. Unfortunately, in the Heart Sutra we find such a paragraph, and it is quite long. That is why in this new translation Thay has changed the way of using words in both the original Sanskrit and the Chinese translation by Huyen Trang (Xuan-Zang). Thay translates as follows: ‘That is why in emptiness, body, feelings, perceptions, mental formations, and consciousness are not separate self entities.’ All phenomena are products of dependent arising: that is the main point of the prajñāpāramitā teaching. ‘Even insight and attainment do not exist as separate self entities.’ This sentence is as important as the sentence ‘form is emptiness.’ Thay also has added ‘no being, no non-being’ into the text. No being, no non-being is the deep vision of the Buddha stated in the Kātyāyana sutra, when he offered a definition on right view. These four words, no being, no non-being, will help future generations not to suffer from a twisted nose. 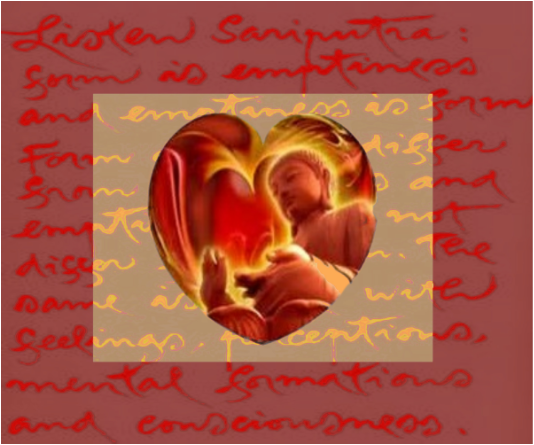 The Heart Sutra was intended to help the Sarvāstivādins relinquish the view of no self and no dharma. The deepest teaching of Prājñāpāramitā is the emptiness of self (ātmaśūnyatā) and the emptiness of dharma (dharmanairātmya) and not the non-being of self and dharma. The Buddha has taught in the Kātyāyana sutra that most people in the world are caught either in the view of being and non-being.